Project: To install a new, high-efficiency heating system. 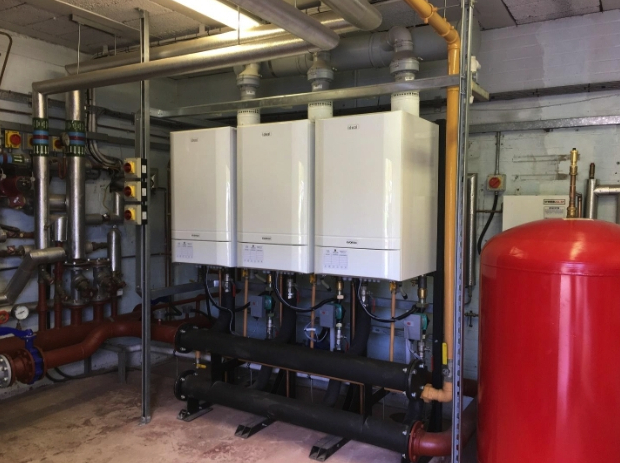 Services supplied: Isolate, disconnect and remove the school’s old inefficient heating system and install a modern, energy-efficient central heating system, including three Evomax Ideal commercial boilers, low-loss header, pump sets, and air dirt separator. Upgrade the existing plant control system. With funding in place, the school plant room refurbishment could proceed. They could prioritise a system that will be long-lasting. A failing heating system can affect learners’ and staff’s ability to learn and teach. A new, more efficient plant room will be able to provide confidence in the school that they won’t have to deal with a cold environment come winter time. During the summer break, we had the opportunity to take on the project to ensure the wellbeing of students and staff in the school by replacing their old boiler plant. It’s critical to us that any institution, be it a business or school, has a comfortable environment to work in. This, of course, includes proper heating. With our fully trained and experienced team, complemented by our trainee and apprenticeship scheme, we felt that we could deliver the project on time, cost-effectively and safely, secure in the knowledge that our workforce has all the correct skills and qualifications. With a strict time frame at our disposal, we prepared ourselves for a swift turnaround that didn’t compromise quality. As well as making significant alterations to pipework, the BMS system needed updating along with a new, twin-walled, stainless steel flue system fabricated and installed. As always health and safety on all our projects takes number one priority. With this particular site we faced working in a confined space and working at height installing the new flue system, but also the school ran a summer holiday club so children, teachers, and parents were all in the vicinity. Once a full risk assessment and method statement were produced the site was set up with safety barriers to restrict access and keep everyone safe. We adhered to our health and safety plan and once again we were pleased that zero accidents occurred. We knew from the outset that this project would require specialist knowledge and skills. Unfortunately, few companies today utilise specialist skills and materials; however, at Higgins, we are proud to say that we do. Many firms now shy away from or don’t have the experience to work on anything over two-inch steel, especially when it comes to welding. However, when refurbishing larger buildings and distribution systems, you require larger diameter pipework and welding. Our in-house coded welder was able to reconfigure the existing pipework, fabricate something new, and weld together all on site. For this particular job, we used four to six-inch steel pipework to connect the existing distribution system to a newly-installed low-loss header to distribute the heat produced by the three Ideal Evomax commercial boilers with a combined output of 450 kW, providing the school with a more reliable heating system. Higgins will continue to support the school with maintenance and servicing of the heating system. If you have a project, Higgins can take on the challenge. No job is too big or too small; our expert team will get the job done. Get in touch today on 01625 613 308 to find out how we can help you.